The discussion is focused on interpretation of the city as home. The interior of the city is related to historical memory and sustainability of city life. The Irkutsk and Siberian identities are discussed. The participants of the discussion propose the ways to arrange the monumental decoration of Irkutsk. and tables set out on the pedestrian way and even on the roadway (114). After the hot Sicily and Naples we are carried away by Olga Smirnova, a wonderful storyteller, to a fairy tale of foggy London (120) and have a five o'clock tea together with a millionaire in Chelsea. Then comes a big article by Georgi Stanishev about Rudy Ricciotti, an architect whose interior of the city blends into the interior of the building, and whose bridges link the fragments of the city like interior doors. The author considers the art of a little-known Russian architect (including his own archival and field research) who worked more than 25 years in Qingdao and who created a huge number of projects and buildings. As a result of the survey of buildings in Qingdao, the author identified more than a dozen buildings designed by V.G. Yuryev, including those preserved up to the present time, such as his own house, the building of the oceanarium, the castle of the newspaper magnate M. Lembich, the Church of St. Paul and other works of the architect. Typological, compositional and stylistic features of the identified buildings are considered in the article. The author gives an anthropological sketch of the urban environment and everyday life through the example of a historical part of London and a visit to one of historic houses. The interaction of natives of London with tourists and guests is described. behavior. Thus, the role of the architect embraces the sphere of socio-psychological management of mass behavior. If we look closer at the biographies of the professionals of the first half of the 20th century, we can see how conventional and inconsistent the simplified scheme of the history of the national architecture of the 20th century is. The traditions of classicism preserved until the middle of the 1950s by old experts, graduates of the Imperial Academy of Arts and the Institute of Civil Engineers, have been lost. Professionalism has been lost together with the traditions. The logical consequence is ruin and chaos in the city environment. The sky is an element of any landscape. In the Russian landscape painting, the sky becomes a peculiar element and a symbol, which absorbs both the historical background and the utopian future of spiritual development. That is why the Russian sky differs from the German, French, English or Chinese one. The sky is an archetype of any stain. Russian landscape paintings have revealed a dramatic synthesis of natural meteorology and human feelings in the sky stain. No one has ever painted the sky so disturbing. Metamorphoses of social life in the USSR in the 20th century occurred so impetuously that the ‘link of times’ supported by architecture of squares was broken. The imperial squares of the Soviet period in Russia, that replaced the cathedral squares, have lost their former mission and failed to find a new life. The attempt to artificially revitalize those squares fails for many reasons: a huge scale, overloading with transport, lack of places of attraction, and new buildings mismatching the character of former development and composition. Installation of swings and benches does not save the situation. It only underlines the inharmony of such designs. There are no squares in the projects for new residential areas. They are replaced by shopping and entertainment malls, which look like giant storehouses. The origin of the obelisk is mysterious. Like many other things in the history of our civilization, it occurs at once, perfectly shaped, without genesis or labour pains. Like the Great Pyramids, it appears ‘from nowhere’, in solid stone structures, in monoliths, and then similarly degrades down to bricks, boards and cemetery plaques. Graffiti as a mass phenomenon emerged on the wave of protest youth movements at the end of the 1960s and has carried aggressive emotions for a long time. Today, graffiti includes the streams bearing a positive emotional charge. Such graffiti is used to change the attitude and behavior of people in many countries. Using the example of the Irkutsk graffiti artist Master Bo (Kartashov), the article shows how the stigma of being a rioter and a vandal hinders the artist from making positive graffiti in Irkutsk. Street art as a part of contemporary urban culture is presented as one of the means of the formation of identity of the place, transformation of the environment and raising its uniqueness. The ‘urbanistic character’ of street art ensures diversity of its forms, breadth of expansion and heterogeneity of its participants, including professional and amateur authors and the unlimited range of residents and guests. Thinking about the feeling of interior of the urban environment, we refer to the emotional experiences of space, where interaction between a human being and a city is like an emotional coexistence. The human being is in the center of a special energy field archetypically experienced as HOME. A human body and an urban body make up a firm integration, the deep senses of which are inevitably manifested in everyday practices of urban life. Graffiti and the issue of its legitimacy arouse a keen interest among architects all over the world. Below are several comments on this challenging phenomenon received from our foreign authors. 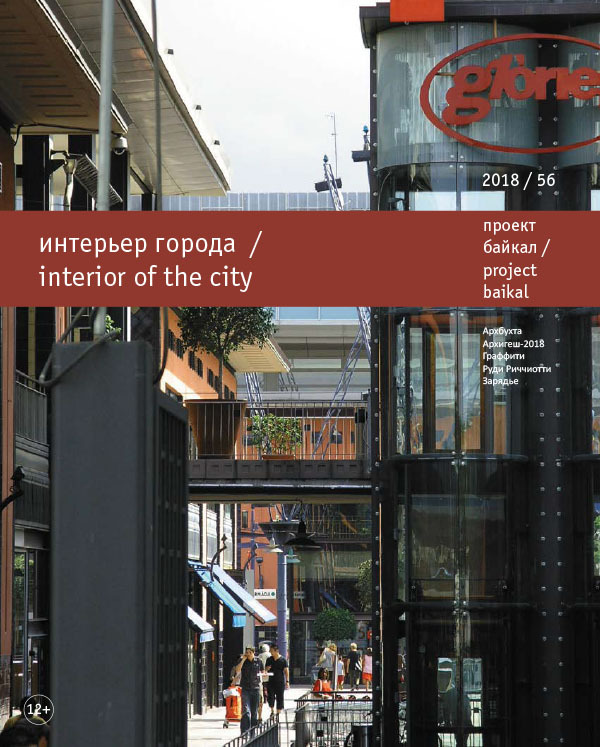 The article reviews the procedure and the results of the All-Russian competition for the best projects for comfortable urban environment in small towns and historic settlements organized in May 2018. It points out the interest among citizens towards the proposed projects and their focus on revealing the cultural identity of small towns and historic settlements. The article describes the procedure of public defence of the winning projects and information support of the competition.